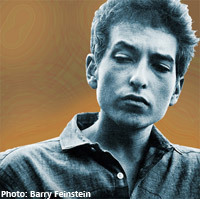 The GRAMMY Museum co-produced three successful programs in conjunction with the Skirball Cultural Center's acclaimed exhibit Bob Dylan's American Journey, 1956-1966. Originally organized by Experience Music Project, Bob Dylan's American Journey, 1956-1966 is the first comprehensive exhibition to examine Bob Dylan's formative early career. Charting his transformation from Midwestern teenager to folk troubadour to rock innovator, it illuminates how Dylan changed the face and sound of American music. It also chronicles a momentous, turbulent time in this nation's history and reveals how Dylan's journey reflects modern America's own development.